I am Somerled. The summer warrior. What am I, if not a warrior? In twelfth-century Scotland, far removed from the courtly manners of the Lowland, the Winter Isles are riven by vicious warfare, plots and battles. Into this hard, seafaring life is born a boy called Somerled. The son of an ageing chieftain, Somerled must prove his own worth as a warrior. He will rise to lead his men into battle and claim the title of Lord of the Isles - but what must he sacrifice to secure the glory of his name? 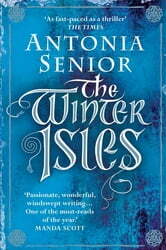 The Winter Isles is an astonishingly vivid recreation of the savage dynastic battles of medieval Scotland: an authentic, emotional, powerful read. An account of the harshness and horror of survival in early medieval Scotland. Yet, for all the blood, guts and aggression, it's a lyrical story full of beauty and love. A sensitive blending of history and fiction.